Changes in the mucus irritate the throat, causing rawness that creates a desire to clear the throat constantly. In some cases, hard and thick phlegm even accumulates in the nose and throat. It is difficult to remove this phlegm. The irritation may extend into the lung, the bronchi and the windpipe. Although many remedies have been invented to treat the drip, resolving nasal obstruction and congestion is the best therapy. In medical terminology, this excessive nasal discharge is called nasal drip (rhinorrhea). The rhinorrhea could be anterior or posterior. The discharge draining from the nares is called anterior rhinorrhea. The anterior nasal drip is generally associated with allergic or viral rhinitis. The phlegm dripping into the throat from the nose is referred to as posterior nasal drip (posterior rhinorrhea). The color of rhinorrhea is greenish or yellowish in purulent sinusitis and transparent or white in vasomotor rhinitis. Postnasal drip during acute sinusitis, cough and nasal congestion can cause pain in the face and headache. The drip may also occur in chronic sinusitis, but the pain is generally non-existent. The drip invariably accompanies nasal obstruction. Most of the asthma patients have nasal congestion, thus, they also suffer from the drip. Posterior nasal drip may occur in the patients suffering from nasal polyposis. The drip may worsen the cough in the night while the patient is lying down. Reoccurring pharyngitis is also associated with the drip. In non-smokers, posterior nasal drip syndrome (PNDS) is one of main causes of chronic cough. Diagnosis of which is based on a number of symptoms, such as nasal congestion, postnasal drip, swelling of inferior turbinates and mucus draining into the posterior pharynx. But, the syndrome diagnosis is not always precise. 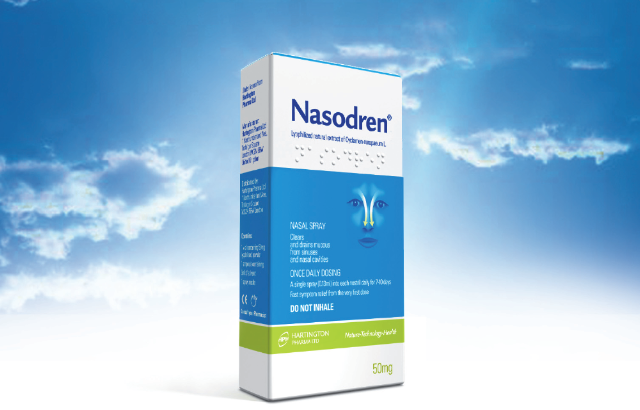 The differential diagnosis (Dx) of the syndrome includes rhinitis medicamentosa, vasomotor rhinitis, non-perennial non-allergic rhinitis and hay fever. Oral decongestants, inhaled steroids and / or first generation antihistamines are administered to treat the syndrome.